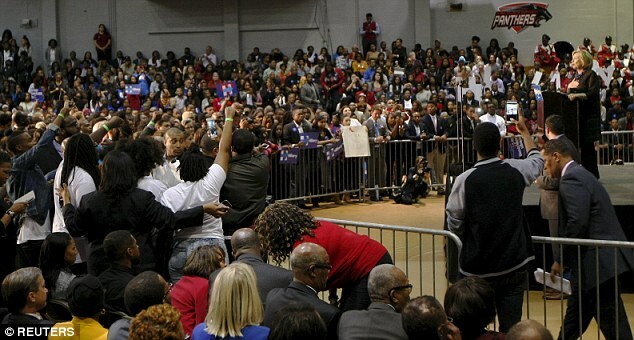 You might have recently heard about Hillary Clinton’s recent trip to Atlanta where she held a rally at the AUC. Signs that read “HBCU’s for Hillary” and “African Americans for Hillary” were given to rally supporters who attended. Black Democratic juggernauts such as Atlanta Mayor Kasim Reed and Congressman John Lewis were there to lend Hillary their support. The auditorium was packed, the stage was set, the crowd was enthused and Hillary was prepared to give the audience her speech. Everything was going according to plan. Until the AUC Shut it Down Coalition protested the venue back to reality. The reality is Hillary Clinton has a lot to answer for before she assumes any support from black people. She has to answer to the role she played in her husband’s overhaul of the criminal justice system that still disproportionately affect black men and women when compared to other races who committed the same crimes. The increase of the prison population by 673,000 inmates in just eight years. Hillary Clinton cannot be absolved of these racist “crime prevention” measures that took place under the Clinton Administration. It is common knowledge she had an office in the West Wing complete with 20+ staffers where she helped shape US domestic policy in the Clinton Administration. I refuse to believe a person as thorough and persuasive as former First Lady Hillary Clinton had nothing to do with the policy measures that she is now vowing to end if she becomes President. With a record such as hers, she can’t just go to the AUC and expect the support from black students just because her husband is Bill Clinton or she worked for President Obama. Her ties to her husband make her less appealing and we all know she’s no Barack Obama. But what she can expect to come across is more black students willing and ready to not only hold her accountable but make her work for the black vote. At the looks of things, she will likely get the black vote due to the fact that Bernie Sanders is a socialist who won’t be able to win a general election for obvious reasons, Joe Biden isn’t running, and there isn’t a Republican candidate who gives a damn about black people. Since she is really the only viable option, there needs to be a continued effort to hold her accountable for her involvement in how the justice and prison systems are today and what we need her to do to fix it, not what she wants to do to fix it.